Emerald Creek Dares: Tricks & Treats for this Dare! Of course this is our Halloween Special! With newly released charms, our favorite designers are creeping their way into the hearts of halloween lovers. Follow each of them so they can show you Tricks of the trade. Submit an entry (and I have seen lots so this should be easy) and we will Treat one lucky individual to $25.00 of store credit. 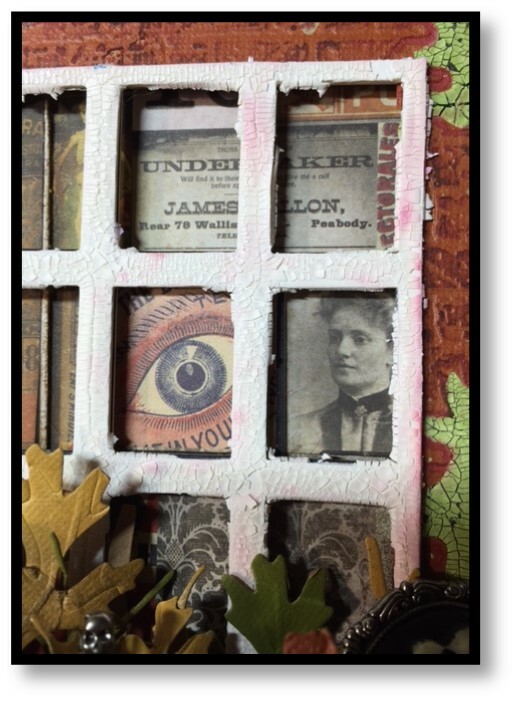 I have been watching you and I have seen lots of haunts and hilarities treating our social media, so hop on and enter yours to see if you can win the prize! 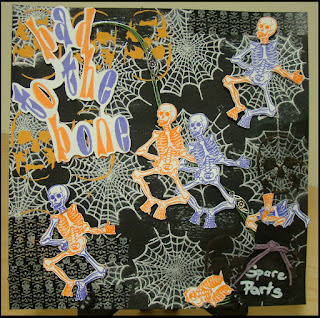 Cathy, she was way too excited for fussy cutting Web and dismantling Funny Bones with her piece "It's all about Bones." 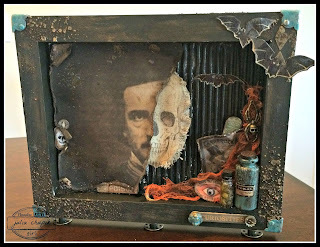 Julia featured Batting Practice when she hit the books to come up with this crypt decaying piece because "Poe Knows Curiosities"
"Hanging around with Funny Bones"
Her use of the Skull Charms and Burnt Copper Leaves is haunting. I loved It! Congratulations to Pam Bray winner of the Fall for Colour Dare. Pam please email Kim for your prize code. WOW - Amazing creations everyone - off to visit you all now. Congrats to Pam too - whoop whoop ! Great displays of creativity, ladies! Congratulations Pam, have fun shopping! Thank you for following and thank you for participating in the last dare. Your falling leaves were a hit! Creepy projects everyone! I love them. Such haunting inspiration. Congrats Pam! Amazing takes on Halloween ladies!! And congrats to Pam! Thank you and so glad to have you participating in the Dares. I loved the piece you entered. 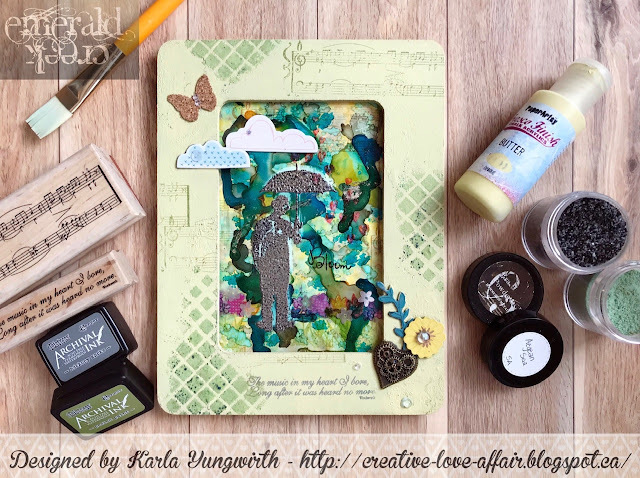 I just linked up; found your blog through Nicole Wright (thanks, Nicole! ), and couldn't resist playing with my Mr. Repulsive! Off to see all these lovely inspiration pieces up close! Congratulations, Pam! Well deserved win! I'm so glad you did! And I love the second entry too. Thank you so much for watching Cathy and then participating in our group of Dares. Can't wait to see you more often. Just found this blog through Sara Emily. 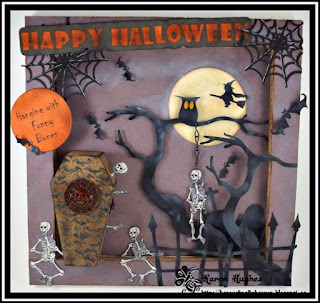 What a way to share those creepy Halloween projects! This is awesome sauce! Wowzers to the talented DT! I just entered my disgusting creation. Ooo thank you for checking us out and entering your awesomely grotesque book. I Love it. Thank you for checking us out! Hope you come visit often. I apologise for entering before reading the rules - just read that you have to leave a comment on each of the DT's blogs - not keen on that so shall delete my entry. Hello Paula, we apologize. That was a mistake, thank you for bringing to my attention. On the design team rules we wanted them commenting on each other's stuff and on our guests pieces that were entering. It was not meant for the contestants to comment on all of the Design Team. WOW the DT did a awesome job with their inspirations. Loved them all. Thanks for sharing everyone! And thanks Karon for the info post about this fun challenge.